Clean lines and simple forms let the beauty of natural wood stand out. Clopay’s versatile Modern Series lets you mix materials, shape and tone to create a stunning contemporary garage door that blends beautifully with other woods and materials on your exterior. The RESERVE ® collection MODERN series of contemporary garage doors provides the perfect blend of handcrafted dependability and clean modern design. 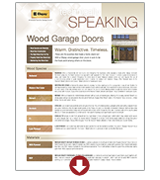 This versatile series allows you to choose from a variety of materials and natural wood tones, creating aluminum and wood garage door configurations that beautifully complement your home. Durable 4-layer wood garage door construction with polystyrene insulation. This garage door has a 5.9 R-value*. Heavy-duty hinges, rollers and track provide smooth, quiet, long-lasting operation. Vinyl weatherseal with optional aluminum weatherseal retainer helps seal out the elements and protect the bottom of the door. Learn More about RESERVE® collection MODERN series construction. RESERVE® collection MODERN series doors are built with a sleek contemporary style and convenient upward-acting operation. Offset Window models come standard with clear tempered glass. Other glass options include frosted and obscure. Accent Strip models feature decorative flush aluminum accent strips to provide a beautiful contrast. All doors can be factory primed, painted White or factory stained. Custom stain and paint colors also available. Doors come standard with spade lift handles and step plate. Additional decorative hardware options are available. Learn More about RESERVE® collection MODERN series design. *Design is available right hand and left hand. **Unspliced models are only available up to 10' wide. Clopay stain colors show on Hemlock wood. Note: Color may vary from on screen. Custom colors are available. Handcrafted 4-layer wood construction with polystyrene insulation provides a durable and energy efficient door.